Updated at 1:27 p.m. with additional comments, background and voices. Department of Defense spokesman Capt. Jeff Davis told reporters Wednesday that the Pentagon won't change its policy that forbids most servicemembers from being armed while on U.S. soil, according to CNN. "We do not support arming all military personnel," Davis said, according to CNN's report. That view is far from universal among those in the armed forces, including many retired veterans. The general tapped to be the next Army chief of staff said Tuesday that if legal issues could be resolved he thinks it would be appropriate, in some cases, to arm soldiers manning recruiting stations. At his nomination hearing before the Senate Armed Services Committee, Gen. Mark Milley responded to questions about the deaths of four Marines and a sailor who were killed Thursday in Chattanooga, Tennessee. Authorities said Kuwait-born Muhammad Youssef Abdulazeez, 24, of Hixson, Tennessee, unleashed a barrage of fire at a recruiting center in Chattanooga, then drove several miles away to a Navy and Marine reserve center, where he shot and killed the Marines, and wounded the sailor, who later died. Abdulazeez was shot to death by police. "I think under certain conditions on both military installations and ... recruiting stations ... we should seriously consider it," Milley said. "In some cases, I think, it's appropriate." Tucked in strip malls in rural and suburban communities and in high-traffic city spots like New York's Times Square, military recruiting and reserve stations are designed to be open and welcoming to the public. The troops inside aren't allowed to carry weapons. The ban is largely due to legal issues, such as the Posse Comitatus Act of 1878, which prohibits the federal government from using the military for domestic law enforcement. 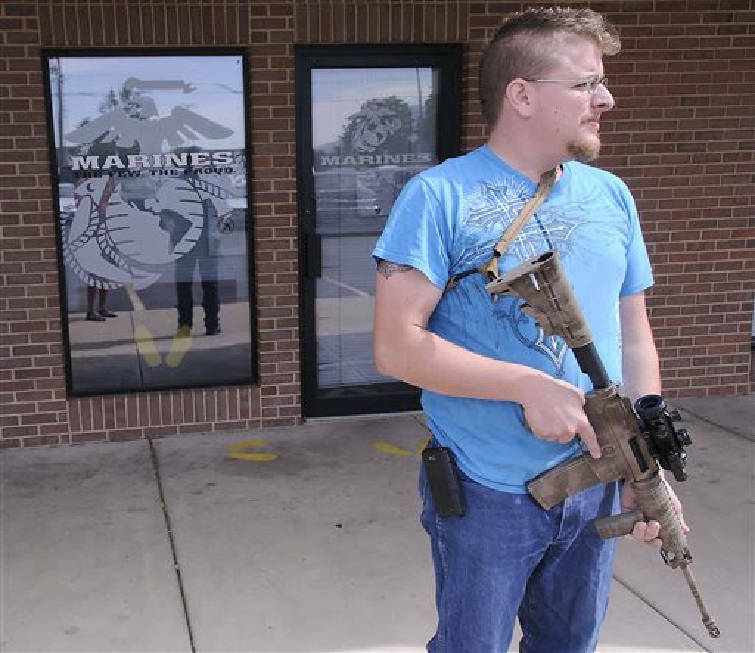 U.S. forces don't routinely carry guns when they are not in combat or on military bases. And Pentagon officials are sensitive to any appearance of armed troops within the United States. The U.S. military has outlined security upgrades for recruiting stations, reserve centers and other facilities. Military officials said security at recruiting and reserve centers will be reviewed, but Gen. Ray Odierno, the Army's current chief of staff, has said it's too early to say whether the facilities should have security guards or other increased protection. He said there are concerns about accidental discharges and other security issues related to carrying loaded weapons. Just outside Atlanta, a recruiter accidently shot himself in the leg with his personal .45-caliber pistol while discussing the Tennessee shootings with one of his recruits. Officials said he showed the sailor the unloaded gun, then reloaded it and inadvertently discharged it as he was putting it back in his holster. Milley currently is head of U.S. Army Forces Command at Fort Bragg, North Carolina. Prior to taking the Forces Command job in August 2014, Milley was the commander at Fort Hood, Texas. He was in charge when a soldier being treated for mental illness gunned down three people and wounded 16 others before shooting himself. During his GOP presidential campaign swing through Nashville today, Gov. Scott Walker said American troops "absolutely" be allowed to carry firearms while working in U.S.-based military recruiting centers and other facilities. Walker noted to Nashville reporters that he "issued an executive order to allow the National Guard in my state to do exactly that. "We have four recruitment centers, and I believe the law and the policy needs to be changed nationally so that our heroes -- the men and women who serve us in the military -- can be protected at these centers or any else where they're out in the public." Walked also said he called Tennessee Gov. Bill Haslam after four Marines and a sailer were gunned down last week at a service center in Chattanooga, noting one of the Marines was a native of Wisconsin "so that touched even more for me personally." On Tuesday, Walker became at least the seventh governor to authorize state National Guard members to carry weapons on duty, following the attack on two military facilities in Chattanooga. Haslam on Sunday issued directives to Tennessee Adjutant Gen. Max Haston to see what steps the state can and should take as well as another director to state Safety and Homeland Security Commission Bill Gibbons to explore expediting state handgun-carry licenses for Guard members. Walker told reporters that "I'm not going to speak for anybody else. I'm just going to tell you what I did. I did it right away because I think it was important, lowering the flags, and after consulting with my adjutant general, I made sure we had an executive order. "Every state is different so I'll let each state respond for themselves but as a governor and as ssomeone who would like to be president, I want to make sure our men and women in uniform are able to protect themselves and their fellow servicemen." In the meantime, citizens from Washington to Georgia have taken it upon themselves to guard recruiting centers, though the U.S. Marine Corps on Tuesday asked citizens to "not stand guard at our recruiting offices." "Our continued public trust lies among our trained first responders for the safety of the communities where we live and work," the Corps said. That trust isn't shared by a handful of governors and many in Congress, including Tennessee's entire delegation, which co-introduced a bill that would allow troops on U.S. soil to carry weapons. Citizen led guard posts have been set up outside recruitment centers in several cities around the country. 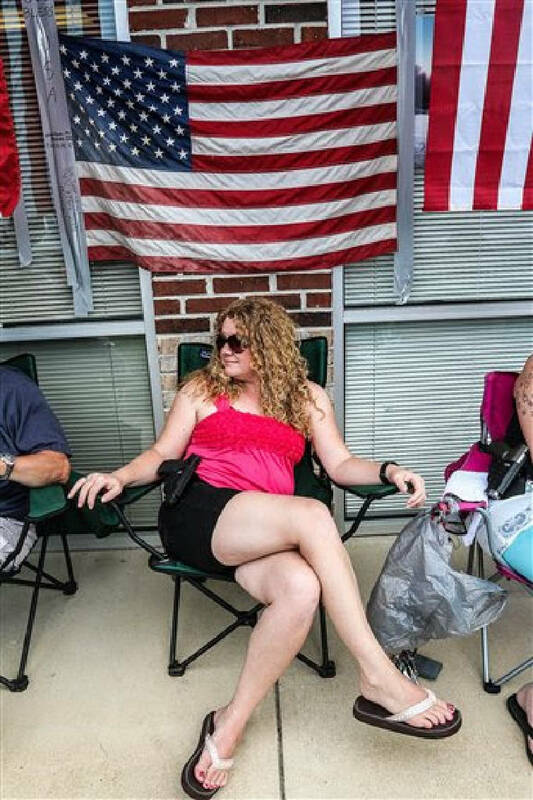 In Hiram, Georgia, Crystal Cole sat in a lawn chair with a loaded handgun in front of an Army and Marines recruitment center on Wednesday. She stood guard along with a handful of other private citizens, including one armed man who preferred not to be identified, who was photographed by the Associated Press standing guard and carrying two American flags. Another group of veterans has been gathering outside of a Madison, Wisconsin military recruitment center to protest a law barring active-duty members who work at such sites from being armed. The veterans say they plan to keep showing up at the facility near the city's East Towne Mall until the law is changed. Their protest follows last week's killing of five servicemen in attacks on a military recruiting office and a Navy-Marine operations center in Chattanooga, Tennessee. The man who allegedly carried out the attacks later died in a shootout with police. Although there is no indication that the Madison site has been threatened, the veterans say they want to show they stand in solidarity with the active-duty military members who work at such centers, Veteran Dave Walters told WKOW-TV. "We love these guys like they're our brothers and sisters," said veteran Dave Walters. At least one of the veterans, who declined to give his name, said he's armed legally with a concealed carry permit. He said he was hoping to protect the recruiters inside the building, including his son, because they're not allowed to carry weapons. Troops at recruiting and reserve offices aren't allowed to have guns. Active service members only are allowed to carry weapons when they're performing law enforcement duties, like standing guard at the gates of federal military bases, said retired Marine 1st Sgt. Tim La Sage. He said he thinks this leaves personnel inside military bases or recruiting sites vulnerable and unable to protect themselves. "If people are being threatened in our country, not just overseas, and are being targeted for their military affiliation, we have an obligation as leaders to protect our troops," La Sage said. 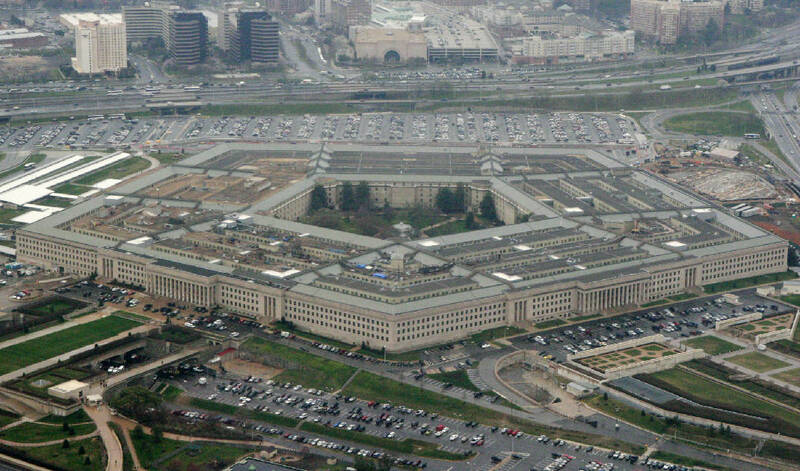 Military officials have said the Pentagon shouldn't rush to change the ban because arming troops in those facilities could cause more problems than it might solve.